Kev Pearson has photographed Glastonbury Tor basking in the Summer sun and covered in a blanket of snow, he’s captured it in the dawn light and at twilight, with the sun shining through the archway of the tower or with the full moon peeking out behind clouds. His pictures show Tor Hill obscured by Autumn mists from the wetlands of the Somerset Levels, or the view from the top. His photographs are a wonderful celebration of this iconic landmark, looking at them you are immediately transported to Avalon. Green was so charming and charismatic. We loved chatting to him… hearing about how his wands were made and learning about the Wishing the World Better Club. After Green had welcomed Zane to the Club and explained that his first wish with the wand should be to wish something good for somebody else, he then gave Zane his own wand and hat to practice making a wish. What’s It Like to Live in Glastonbury? You may have noticed a friendly character trading at the bottom of Glastonbury High Street. Often dressed in green and sitting over a tiny portable stall adorned with beautiful handmade wands. His tall frame was accentuated by a green top hat sprouting long feathers, locals know him as Green, the Wand Seller. One day, Green vanished. How CBD helped me give up tobacco smoking, virtually painlessly. Plus, my musings on the surprising lack of actual miracles in Glastonbury Town. When you are choosing Christmas gifts, please buy from small local suppliers and support Glastonbury’s independent shops. We are lucky to be able to buy directly from artists, craftspeople, musicians, designers, writers, knitters, potters, jewellers, candle makers and other creative people. When we buy from the maker we are supporting a family, not a corporation, and bringing more art, beauty and creativity into the world. Free Cannabis, proprietor of Glastonbury’s ‘Hemp In Avalon’ shop, is a man on a mission: to raise awareness of the many benefits of cannabis. A guest post from David Taplin. “Just as the people we have been in our past are still alive within us, the Glastonbury I first knew and loved 45 or more years ago seems to me very much still alive within the current town; it’s like having a foot in two worlds simultaneously (rather appropriate for this place, perhaps)”. Much as dog lovers might try and deny it, other animals exist too. I recently wrote a post on visiting Glastonbury with canine companions, so I thought I better write about our other furry and feathered visitors too. Many residents and visitors are fed up with some of the behaviour on Glastonbury’s streets. Why is there a problem and what can be done? Does Glastonbury Town welcome doggie visitors? I attempt to answer the question and provide some ideas of where you might want to visit with your canine companion. Who Stole Glastonbury Co-op’s Giant Magnet? The Co-op has always exerted a strange and inexorable pull on my solar plexus, as if a huge and powerful magnet lurked behind the shelves. Lately it’s as if the magnet has been tuned off. What’s happened? I investigate! Who are the real celebrities in Glastonbury Town? It’s an oft heard complaint that you can’t buy anything useful in Glastonbury. This is of course nonsense. What could be more functional than a mirror ball Ganesha? Who needs underwear when you can simply don a very long cloak? As Kim said to me earlier “I don’t actually want a cauldron, but it’s nice to know I could just pop into the High St and buy one if I did”. 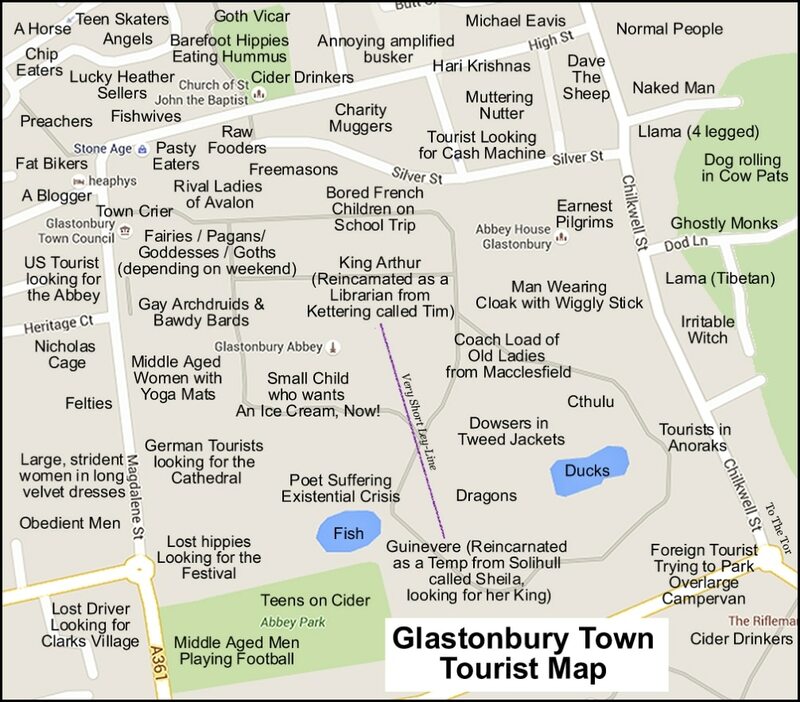 I hope you find this Tourist Map informative and useful on your trip to Glastonbury Town. For a version of the map you can zoom in on click here. To see what Glastonbury was like in Medieval Times please take a look at this map. I love Glastonbury, I’ve been visiting since the 8th of August 1988 (8/8/88 of course) and have lived here since July 1993. I’ve tried moving away, even emigrating, but I’ve been pulled back repeatedly – by the Glastonbury rubber band effect as it’s locally known. Glastonbury is an endlessly fascinating parade of engaging characters, mythology and history, interesting shops, and great musicians. Except on my less positive days when it’s shabby, shambolic and full of nutters trying to blag a quid. Read moreWhat’s Normal for Glastonbury?